The Lhasa Apso originated in the area of Tibet over 4,000 years ago as a small breed of mountain wolf. They were domesticated and actively bred perhaps as long ago as 800 BC, which makes the Lhasa Apso one of the oldest recognized breeds in the world. Recent research has shown the Lhasa as one of the breeds most closely related to the ancestral wolf. Others are Akita, Shiba Inu, Shar-Pei, Chow, Basenji, Alaskan Malamute, Siberian Husky, Saluki, Afghan, Pekingese, Shih Tzu, and Samoyed. Referred to in Tibet as Apso Seng Kyi, which can be translated as "Bearded Lion Dog", the Lhasa's primary function was that of a household sentinel, guarding the homes of Tibetan nobility and Buddhist monasteries, particularly in or near the sacred city of Lhasa. The large Tibetan Mastiffs guarded the monasteries' entrances, but the keen hearing and sharp bark of the Lhasa Apso served to warn residents by acting like a burglar alarm if an intruder happened to get past the exterior guards. It was believed that the bodies of the Lhasa Apsos could be entered by souls of deceased lamas while they awaited rebirth into a new body. Lhasas in Tibet were never sold. The only way a person could get one was as a gift. In the early 1900s, a few of the breed were brought by military men returning from the Indian subcontinent to England, where the breed was referred to as "Lhasa Terrier". The original American pair of Lhasas was a gift from Thubten Gyatso, 13th Dalai Lama to C. Suydam Cutting, arriving in the United States in 1933. Mr. Cutting had traveled in Tibet and met the Dalai Lama there. At this time, there was only one Lhasa Apso registered in England. The breed was at first called the Lhasa Terrier, later the Lhasa Apso. The American Kennel Club officially accepted the breed in 1935 in the Terrier Group, and in 1959 transferred the breed to the Non-Sporting Group. In the UK, they are placed in the Utility Group. Certain characteristics which are part of the breed type evolved as a result of geographical and climatic environment - the high altitudes, the dry windy climate, the dusty terrain, the short hot summer and the long bitterly cold winter of the Himalaya region. Among these are head features, the coat, eye-fall, the musculation and body structure, the general hardiness and longevity of the breed. DNA Analysis has identified the Lhasa Apso as one of the 14 most ancient dog breeds, verifying that lap dogs and companion dogs were among the first dogs bred by humans. 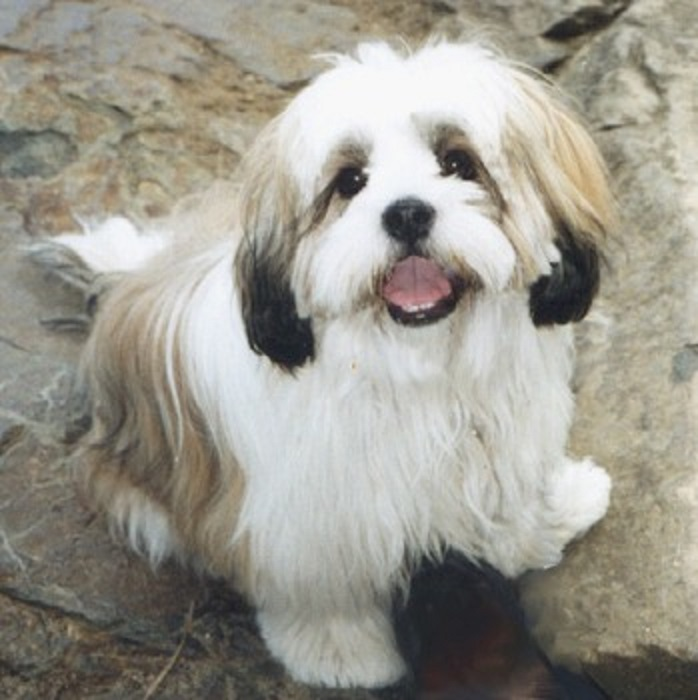 Currently, there is worldwide concern that it is necessary to breed some of the original Tibetan Lhasa Apsos into the Western bred line which is now 60 years old, to maintain the Tibetan authenticity of the breed. The two lines now differ in some ways which is a concern to breeders who want to properly preserve the breed. There is also some concern for Tibetan Lhasa Apso lines because many dogs were killed during and after the Chinese invasion of Tibet because of the breed\'s strong cultural symbolism to Tibetans.